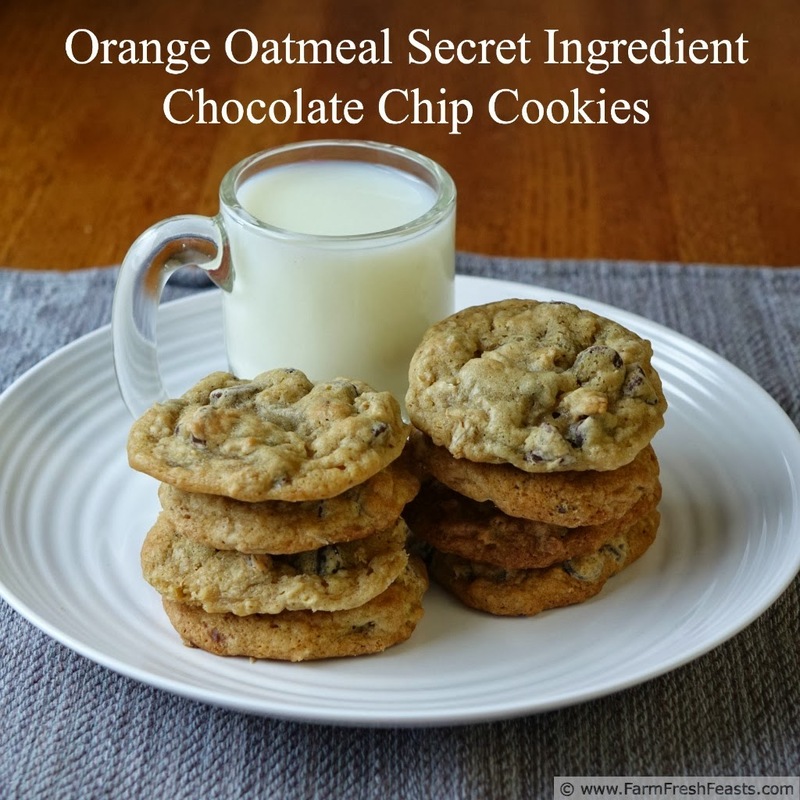 A tender and tangy twist on the classic chocolate chip cookie--with freshly squeezed orange juice and zest, some oats, and cream cheese. This is a wonderful cookie. Welcome back to HashtagOrangeWeek here on the blog. While oranges aren't exactly a local, farm fresh, food to me in Ohio, we've been enjoying cases of citrus shipped up from Florida as part of the Band Fruit Fundraiser. Why did the band sell fruit? To raise money to travel to Florida and march in a parade down Main Street in the Magic Kingdom! Where am I now? In Florida, watching the band march in a parade down Main Street. See how the circle comes around? 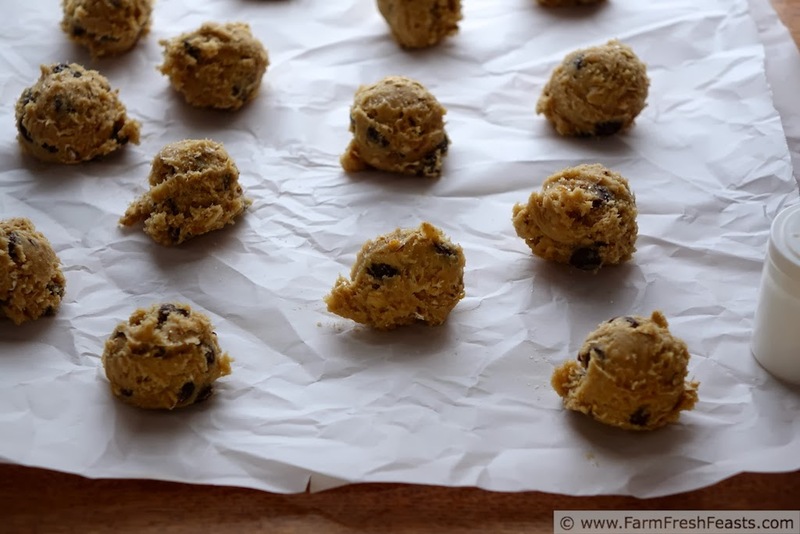 On Monday I showed you how I treated myself--and the kids--to Orange Olive Oil Date Muffins. On Friday I'll throw oranges on a pepperoni pizza--and live to tell the tale. But for now, while I bask in the sunshine of the Sunshine State . . . I present you with Orange Oatmeal Secret Ingredient Chocolate Chip Cookies. I'm realizing that I treat my son's sled hockey teammates, and their families, better than I treat my own family. I'm sure that's a symptom of something--taking those closest to you for granted and being kinder to complete strangers. In addition to eating more avocados in 2014, I shall resolve--at this late date--to make more treats for my family. I had it in my head that I wanted to make chocolate chip cookies with cream cheese in the batter. I tried a few cookbooks looking for recipes without success, but a couple of minutes on the laptop and Boom! I found Kelly's Secret Ingredient Chocolate Chip Cookies. I wasn't content to merely make a tried and true recipe to share at the team dinner. No, I had an idea to use one of the Band Fruit Fundraiser oranges to add an orange-chocolate twist to the cookies. Apparently cooking something for the first time for an audience--who don't have to like it--is getting to be a habit. Oopsie. Thank goodness for amazing food bloggers! Kelly's directions are clear and easy. I was able to make her recipe, including my orange & oatmeal adaptations, one afternoon while dinner was in the oven. Then, like I always do with cookies and often do with pizza dough, I stuck the dough in the fridge to bake the following day. Imagine my surprise when I got online for Chef Dennis Littley's weekly Good Day Google Plus Hangout on Air--and one of the panelists is Kelly! It was pretty cool to be able to say "hey, I've got your dough chilling in my fridge". I know whenever someone tells me they've made one of my recipes it makes me feel good! Notes: Plan to make this dough at least a day ahead. It needs to chill [don't we all]--to firm up, [again, don't we all?] to allow the butter and cream cheese to enrobe the flour, and to give yourself a break from kitchen marathons. I used a tangelo in this recipe, but any type of orange would work just fine I think. 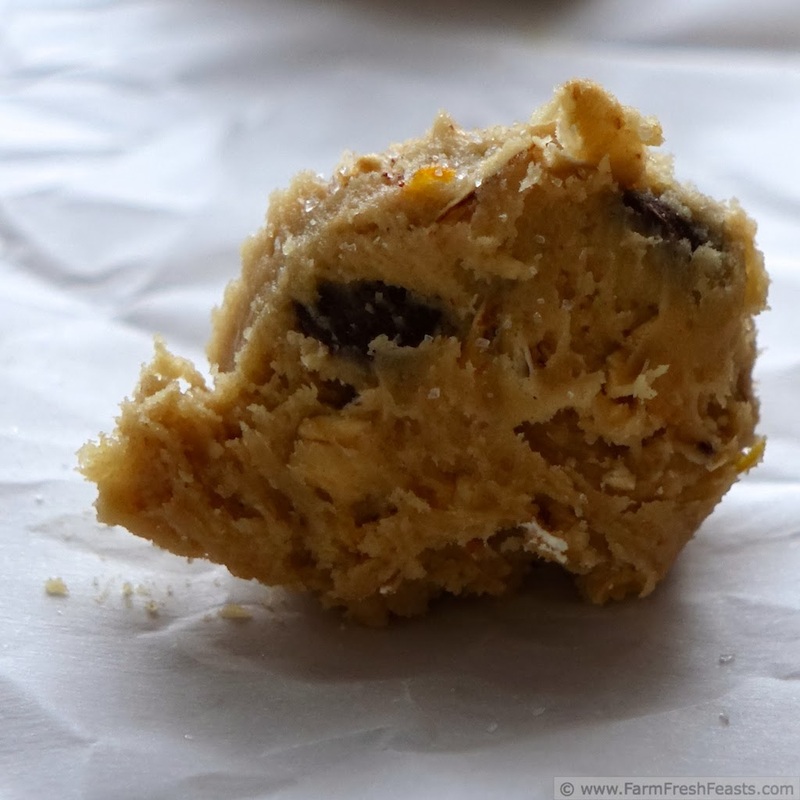 The dough looks very loose initially, with the addition of orange juice and zest, but the oats will firm it right up. Don't worry! Just chill out, literally, and tomorrow it will be firm and scoopable. In a large bowl (I use my stand mixer) dump the cream cheese and butter, orange juice and orange zest. Cream together, then add sugars and vanilla until thoroughly mixed. Dump in eggs and mix well. Dump flour, baking soda, and salt on top, then mix that in. 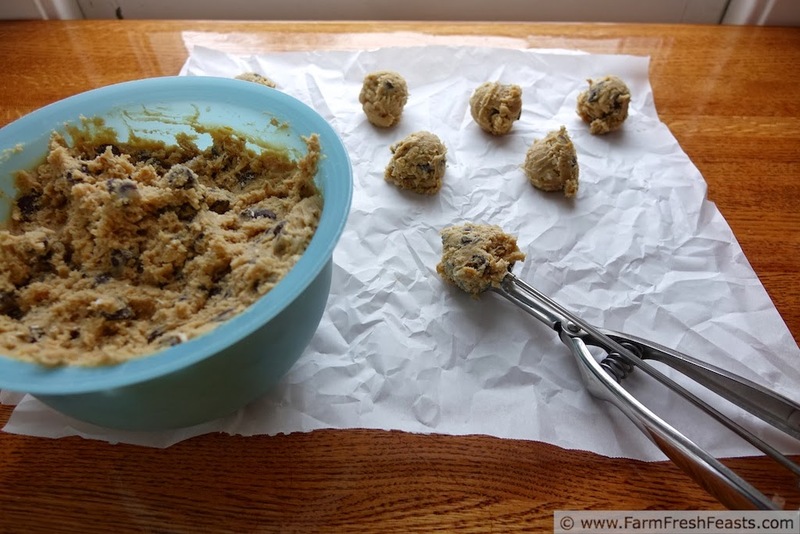 The batter will look a little loose, but adding in the oats and chocolate chips brings it back together. Chill overnight (or at least 4-6 hours). When you're ready to bake, preheat the oven to 375 degrees Fahrenheit. 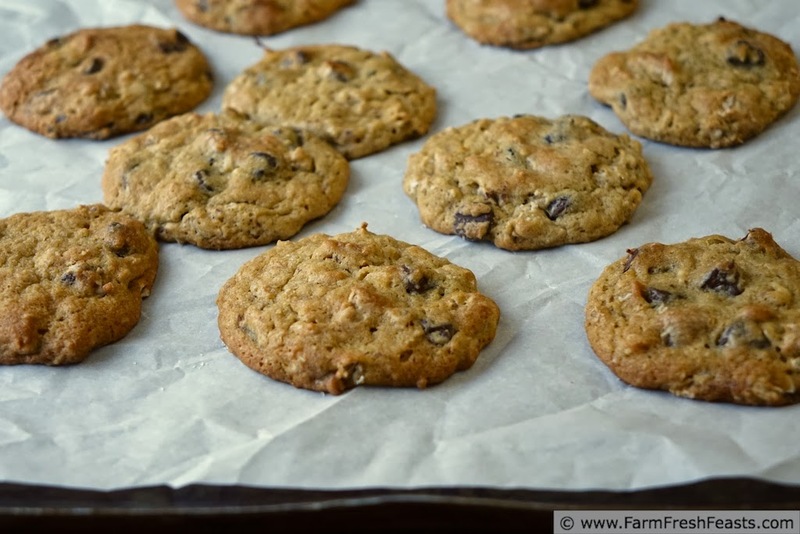 Scoop (Amazon affiliate link to my favorite cookie scoop) batter onto parchment paper. 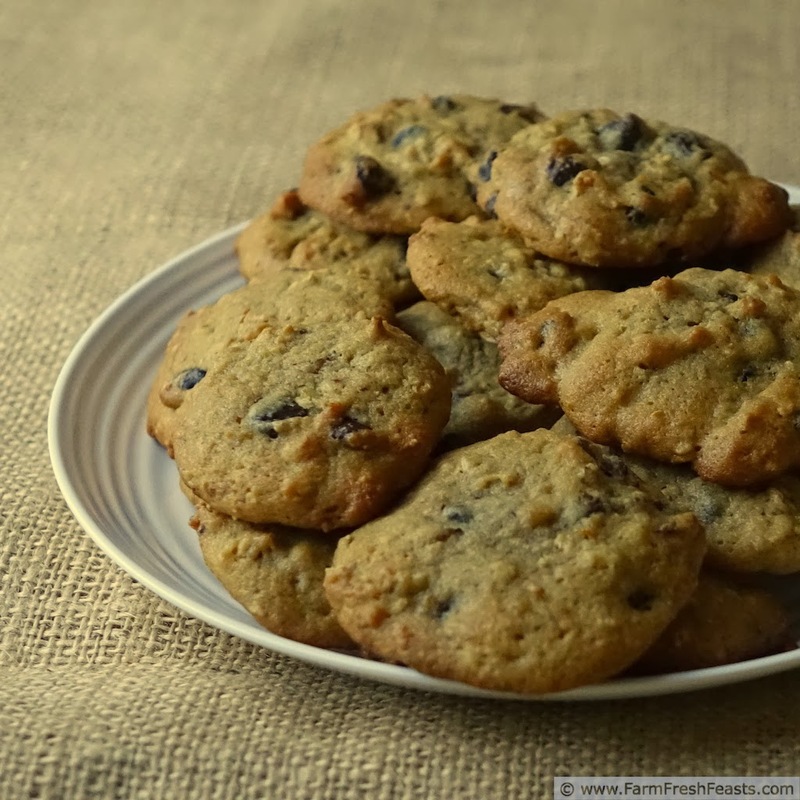 Sprinkle a pinch of kosher salt on top of cookies, as shown. Bake for 9-11 minutes (I usually use 11) then cool, on the cookie sheet, for 5 minutes before transferring to a cooling rack. *Composting pig gets the squozen orange slices. Nary a thing to waste around here. This post is shared thanks to Meghan with Fresh Foods Wednesday, What's Cookin' Wednesday, Week In Review, Tasty Tuesdays, Clever Chicks Blog Hop. I also am thoroughly enjoying HashtagOrangeWeek with hashtag spelled out no less. It makes me giggle. I nearly made next week HashtagBeetWeek but I decided it would be too. much. Hashtag. and went with a stealth beet week instead. I'll give you snacks next time I see you! Over the top amazing! Thanks for linking up with What's Cookin' Wednesday! Thanks for pinning this, and thanks for hosting! To be honest--I can't wait to see what I link up this week either! I've got to get busy writing and editing, LOL!